This is a long time ago that we had present a comparison between two mobiles. Today we spare some time to renew out this segment and we manage to compare two beautiful smart phones having Quad-Core processor. 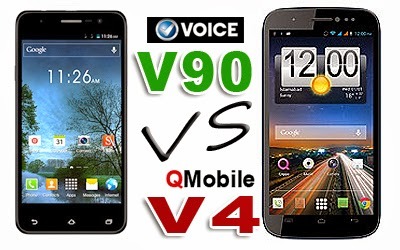 Voice Xtreme V90 and QMobile NOIR V4 both have Quad core processors . 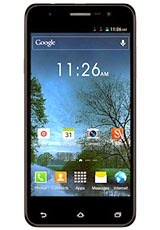 Both Mobiles are released in February 2014 and have good bodies. 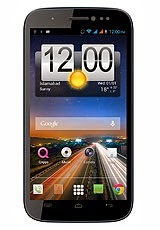 The clock hertz rate of QMobile V4 is slightly lower than Voice Xtreme V90 . As the V4 has 1.2 Ghz Quad-Core processor whereas V90 has 1.5 Ghz clock rate in the same Quad-Core line. But NOIR V4 has the edge over the Voice mobile in screen size. The screen of NOIR V4 is larger than the other . It has mega 5.7 inch screen as compare to 4.7 inch screen of the V90 by Voice mobile. Screen size difference is quite handsome and this is the reason that the body of NOIR V4 is bigger than V90. If we talk about the cameras , Voice V90 has slightly big camera that is 13.0 Mega pixels and NOIR V4 has 12.0 Mega pixels primary camera. The results of both the phones are excellent and both have a lot of features in the camera user interface to enhance the quality of images. Voive V90 has the smart gesture supports whereas V4 lacks it . Here we develop a comparison table that shows the features of both phone side by side. 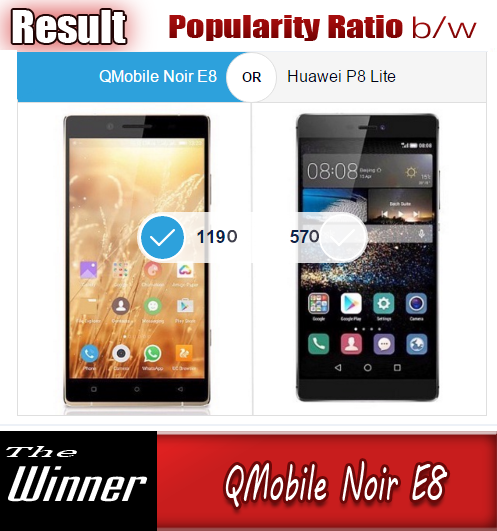 This will tell you the story in a more better way and explore the abilities of both the smart phones of almost same price range.